Oh my word! The Dilemmas of Design. Once you have ordered your VIP Interior Designer Package we make an appointment for the first consultation. I will email you to set up a date and time that works for you. You will get a little questionnaire to fill in and I’ll ask you to send me some photos or a video of the room we are going to work on. 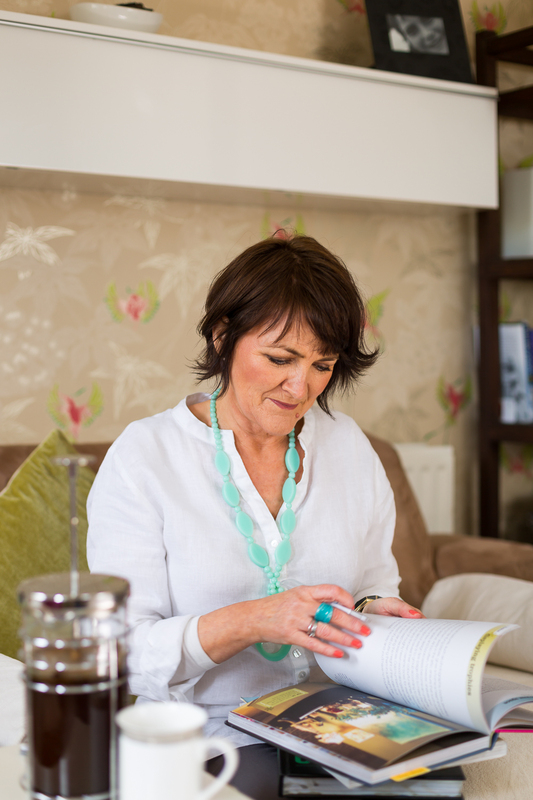 I’ll call round to your home and I’ll gather all the details for the project and I’ll take you through my Interior Analysis Questionnaire so I have a really good understanding of what you are looking for. A floor plan – So you can see where to place furniture. 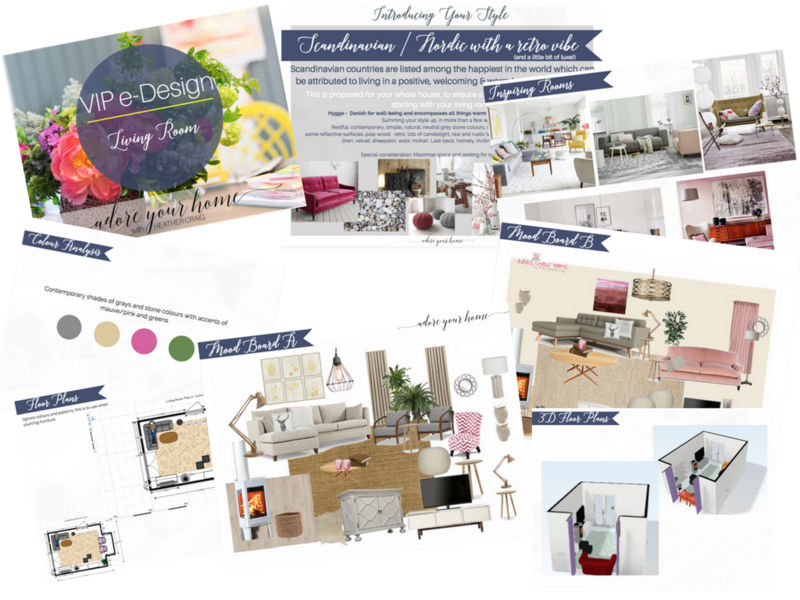 A design moodboard – Digital (you can on an iPad or computer) which brings your new design to life! There may be 2 of these to show you slight alternatives. Style interpretation – I will identify which style is most appropriate in line with your assessment. Colour analysis – This includes a personal palette for the room and exact paint colours identified. Furniture placement – What looks best where, what you want to keep and what you could buy. Windows – Recommendations for how best to dress them. Flooring – What would work best for your needs and personal style. Fabric – Providing you with exact choices and product codes to suit your style and budget. Lighting – Recommendations of lighting products and how to use it properly for greatest effect. Art – Where to place it and how best to incorporate it within your living space. Shopping List – If I have sourced anything new, I’ll give you the details. Here’s a little peek at one of my designs I created for a client…yours will be bespoke to you! This will be emailed to you and any samples of fabric or wallpaper will be posted. You will have all your dilemmas answered and you can stop all the endless home magazine research. You will stop feeling overwhelmed every time you walk past that room! You will have confidence to get the ball rolling and know what things to tackle first. As a FREE BONUS, we can arrange a 30 min phone call to chat about anything you need help with a couple of weeks after the design has been delivered. You can ask me anything you’re not sure about or pick my brains regarding anything relating to your design brief. I will ALSO throw in my Magnolia to Marvelous Online Programme worth £50 so you never need struggle with paint and colour choices again – yay! There’s no time like the present. Now’s your chance to get your house back and that beautiful home you have been waiting for. Spaces for this package are ALWAYS limited, as I only have a few slots every month & do get booked up, so book yours today. My name is Heather Craig, owner of Adore Your Home and I’m here to HELP YOU – you don’t have to tackle all this by yourself any longer. I am a mum and a business owner and I have learned an awful lot about making a home comfortable, stylish and functional. Before I started designing, I even made a few hideous décor mistakes myself and wasted time and money buying (sometimes big expensive) things because I hadn’t the experience I now have in abundance! Years ago, I even managed to buy the most infuriatingly uncomfortable sofa, the arms were as high as the back and I loathed it…but it’s long gone now! I am an Interior Designer as well as a House Doctor Consultant – both of which mean I know about how to create stylish, functional and family-friendly homes that just work. Fifteen years ago I started making bespoke hand-painted wedding stationery in my first creative business (and worked with Harvey Nichols) selling it 7 years later. However, I have always had a real passion for of the colourful world of interiors and so grabbed the chance 7 years ago of making a career change to pursue my dreams. I took an interior design qualification to develop my talents and skills and I absolutely loved it. I then got lots and lots of practice creating gorgeous designs for family and friends & so my business grew steadily from there, to where it is today, which keeps me very busy helping people make the most of their homes! I then decided to learn to help people prepare their home for sale, to give it the best chance of selling quicker and for more money, so I trained with The House Doctor of Channel 5 and am a qualified House Doctor Consultant. So essentially, I specialise in helping busy ladies like you make your home somewhere you love living, working, relaxing, and entertaining in!